While the Schulich School of Music houses over 70 grand pianos, a unique, 130-year-old Steinway is tucked away in neighbouring Royal Victoria College, a McGill University residence hall. Hailed in 1887 by The Decorator and Furnisher magazine as “the most beautiful concert grand ever designed,” this one-of-a-kind instrument was commissioned from Steinway by Sir Donald Smith (also known as Lord Strathcona), who wanted the finest piano around to complete his parlour’s décor. Cutting an impressive figure, this 9-foot Steinway New York model-D features ornate carving on all of its surfaces, from the side panels to the pedal box. Initially leaving the Steinway factory as a plain, unadorned piano, the subsequent design and woodworking job fell to Pottier & Stymus Co., who Smith had previously hired to do lavish cabinet work around his home. As he was Co-Founder of the Canadian-Pacific Railway, President of the Bank of Montreal and principal shareholder of the Hudson’s Bay Company, the price of such extravagant interior decoration jobs was no concern. After Smith’s death in 1914, the piano wound up being donated by his family to Royal Victoria College, which was constructed through Smith’s funding almost two decades earlier and served as McGill’s women’s college. To this day, the concert grand has sat in the building’s lounge and has been used by generations of students. However, such frequent use over the years resulted in many patch jobs to keep the piano in playing shape. Eventually, an extensive re-build of the instrument was needed – a job that fell into the hands of Christopher Smythe, Piano Technician at McGill University. The major overhaul was able to take place in 2008 thanks to generous donations by the late Dr. Graham Sommer to improve student life at Schulich. Looking back, Smythe described the project as a serious (but enjoyable) challenge. Thanks to Smythe’s careful work, the piano is back in full playing condition for students to enjoy for many more years to come. 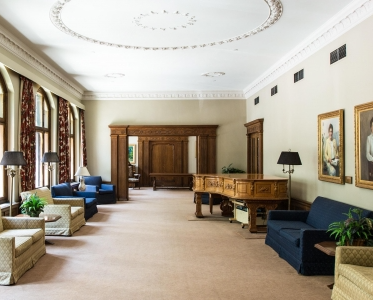 Learn more about Royal Victoria College residence hall and see Strathcona’s piano in the building’s lounge in this Virtual Tour video by McGill University.